In the above video, Eric Cantor is shown speaking regarding the U.S. government shutdown and partial funding via separate bills. He is shown with several of his colleagues. Behind the House Majority Leader and to his left is the Majority Whip, Rep. Kevin McCarthy. Between McCarthy and Cantor is an as yet unidentified woman. 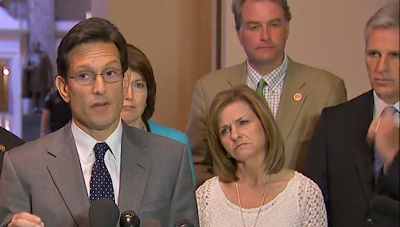 At 1:13 in the video, Cantor continues, "And so I would ask my friends in the media to, to look at the votes we've taken. Fifty-seven democrats have voted with us in a bipartisan way on all these bills, ah, in fact unanimously today to ease the pain of the shut-down. I would implore my friends in the media to ask majority leader Reid, why is he not bringing up any of these bills. Because I think there is a majority of Senators to support these bills to ease the pain on the American people while we continue to wait for the President to join us, ah, in these discussions to work out our differences." 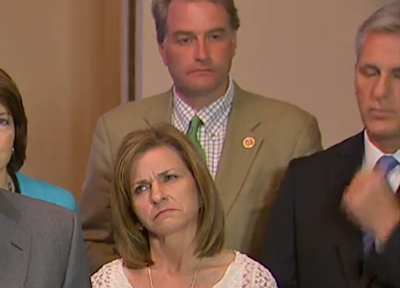 Kevin McCarthy reaches for his nose at the same time as the unidentified woman between him and Cantor and tilts her head to her right. 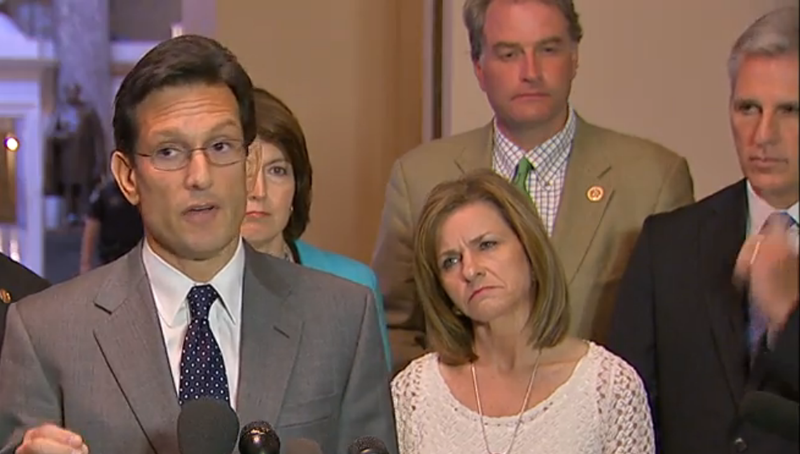 This occurs at 1:17 just after Cantor says (the first time) "...my friends in the media...". 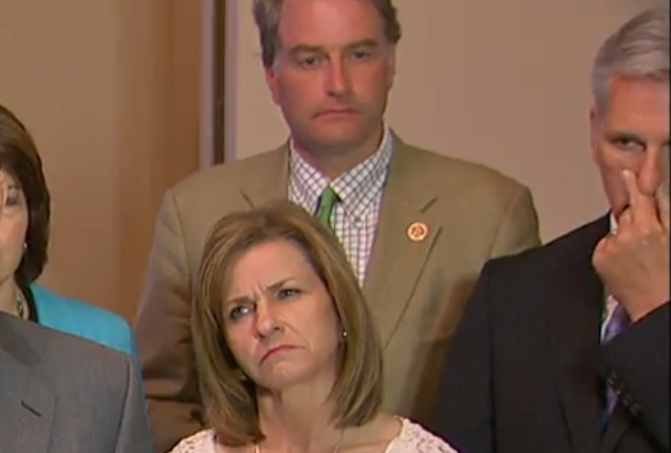 In this context, this nonverbal connotes that Rep. McCarthy cannot believe that Cantor referred to the media as "my friends". Of course in Washington when members of the government refer to someone as "my friend" it means the complete opposite. Perhaps McCarthy thought that this was a bad tactic or even perhaps that he believed that Cantor meant to say "... my (Democrat) friends in the Senate...". 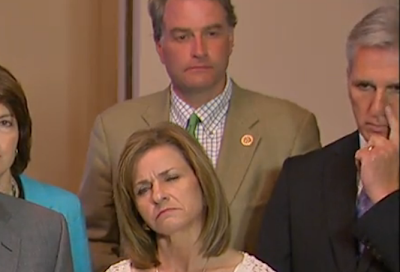 Here Rep. McCarthy rubs his nose even more vigorously. No doubt his nose really itches. Anxiety causes releases neurotransmitters known as "natriuretic polypeptide b" (Nppb) to be released. This creates the real sensation of an itch and therefore it is subsequently scratched or rubbed. The bilateral eyelid closure in this context is consistent with his cluster of disbelief. His psyche is trying to "make this mistake go away"
This image, a close-up of the first one above shows this immediate head tilt signifying her critical-quizzical mindset. 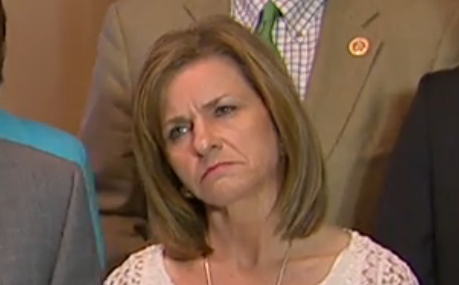 She too is wondering virtually the same thing as McCarthy. This head tilt is well recognized by some, although its sudden presence often does not elicit clarification. It often is accompanied by a partial eyelid closure - more often in one eye (exemplified on her left). When it has a particularly critical slant to it, this expression may also be simultaneous with a head-neck retraction (away from the speaker) and a simultaneous contempt or disgust expression (neither present here). It is interesting a how often those in the backgrounds, who are not speaking, but who are supposed to be presenting a unified front, let their own feelings slip via their body language. What other nonverbal signals do you see in this video?